As for all of the candidates on this year's ballot, this election cycle has been a very long, frustrating, rewarding and exhausting road. An extended primary thanks to some federal judges and the Democrats, a July runoff election and then a shortened sprint to the finish line. Former Texas Solicitor General Ted Cruz will cross that line sometime after 7 pm tonight and become Senator-elect Ted Cruz. That is a very hard-fought and well-earned title for him and a great victory for conservatives in Texas. Last night I had the opportunity to have an exclusive interview with Cruz on the eve of his election. 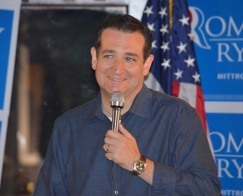 He spoke to a packed house at a meeting of the Spring Branch Republicans. Also speaking at that event was Houston Congressman Ted Poe who will be earning his fifth term as a Representative of the 2nd Congressional District of Texas. 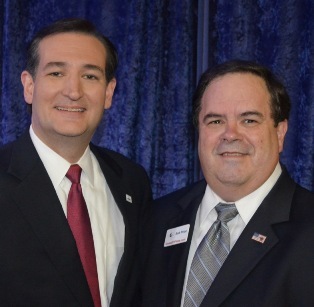 Last night I heard the phrase "Ted Squared" referring to the conservative duo of Teds Poe and Cruz. Many other local officials spoke prior to Cruz's pre-victory speech. Cruz spoke of the journey of this campaign. He spoke of the early polls where he was polling 2% and the poll had a 3% margin of error. You could say he started the campaign at -1%. He spoke of the great people of Texas who came out by the thousands to volunteer and put their, in the words of our Declaration of Independence, "lives, their fortunes and their sacred honor" on the line as they publicly came out in support of Cruz over a very powerful Lt. Governor David Dewhurst, who was also seeking the seat being vacated by the retiring Senator Kay Bailey Hutchison. After Cruz won the runoff election in July, all Republicans circled around him and everyone knew the Democrat placeholder candidate did not stand a chance and Cruz would be our next Senator. To his credit, Cruz ran his campaign like he was behind. He traveled across this state and selflessly helped down ballot candidates like State Rep. J.M. 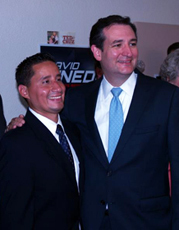 Lozano in South Texas and State Rep. Candidate David Pineda in Southeast Harris County. Two people who are strongly needed in Austin next year. 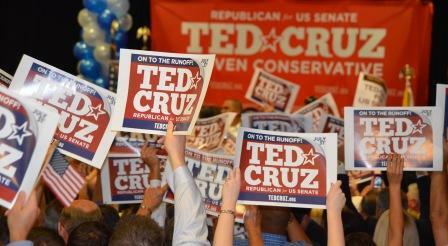 Rally after rally, Cruz helped others and earned the victory he will receive tonight. Cruz will face a lot of challenges when he goes to Washington D.C. Whether he will be in the majority party or minority party is yet to be determined. As a true conservative, Cruz will be part of a very small but growing group of Senators who will fight our battles for smaller government and reduced spending. President Obama will be leaving a mess when he leaves office in January. Yes, I am predicting Romney's victory tonight as well. But if he remains in office, it is even more important we have Senator Ted Cruz going to Washington to fight for us. This has been an amazing campaign to watch. The team of staff and volunteers Cruz has surrounded himself with have run a near perfect campaign. Many of these people will go on to serve us in Washington and in Cruz' Texas district offices. They have earned this just as Cruz has. Tonight will be a very special night for Ted Cruz and his family. But is an equally special night for Texas and Texans. This son of a Cuban immigrant, this fighter for liberty, this defender of the Constitution will serve with honor, pride and distinction as our next U.S. Senator. Well done Ted!